An immigration judge with the Justice Department has granted a stay to John Demjanjuk, the Nazi war crimes suspect who had been ordered deported to Germany, his lawyer said Friday. John Broadley said the stay was ordered after Judge Wayne Iskra in Arlington, Virginia, decided to reopen deportation proceedings. “In the four years since his deportation was ordered, his health has seriously deteriorated,” Broadley told CNN in a telephone interview. Broadley had argued that Sunday’s plan to send Demjanjuk to Germany, which has issued an arrest warrant for him, and putting him through the rigors of a trial there would be tantamount to torture. Demjanjuk — a Ukrainian — is accused of involvement during World War II in killings at a Nazi German death camp in Poland. He denies the allegations. The retired auto worker celebrated his 89th birthday Friday with his wife at their home in Cleveland. 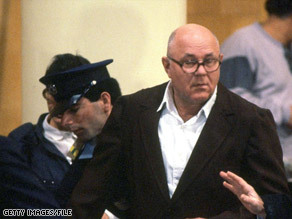 Broadley said Demjanjuk suffers from pre-leukemia, kidney problems, spinal problems and “a couple of types of gout.” German authorities issued the warrant for Demjanjuk on March 10, accusing him of being an accessory to 29,000 counts of murder as a guard at the Sobibor death camp from March to September 1943. Demjanjuk says he fought in the Soviet army and later was a prisoner of war held by the Germans. Demjanjuk has been fighting charges of Nazi war crimes for well over two decades. He was extradited from the United States to Israel, where he was convicted in 1986 of being “Ivan the Terrible,” a guard at the notorious Treblinka extermination camp. The conviction was overturned by Israeli courts on appeal and he returned to the United States. The United States filed new charges against him in 1999, again alleging that he had been a concentration camp guard. A federal judge found in 2002 that Demjanjuk had been a guard at the Sobibor death camp, where a quarter of a million people were killed during World War II, and at two other concentration camps. Prosecutors argued that Demjanjuk concealed his history when he came to the United States in 1952. He was stripped of U.S. citizenship and has been awaiting deportation since 2005, despite fighting his case all the way to the Supreme Court. Liberians facing mass deportation from U.S.